Samsung Polling Software at Cash Register Store.com. 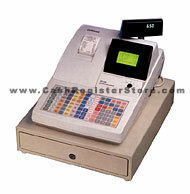 The versatile Samsung ER-650 is our lowest priced cash register that can be equipped for scanning. This system can scan up to 1,000 products. With added RAM you can boost your scanning ability to 14,000 items, have up to 99 clerks and up to 99 group totals. The ER-650 is equipped with 2 RS-232C ports and IRC available on every Samsung ER-650. Using IRC (inter register communications), up to 8 registers can be connected for consolidating store wide reports and/or programming. Each RS-232C port can be connected to a phone modem or PC scanner, scale, remote printer, or remote pole display. Optional communications software can be used to upload or download register data directly from a PC, or via a phone modem. Daily transaction details, as well as sales and financial reports can be uploaded to your PC for storage and/or further review. Other optional software packages offer Quickbooks connectivity, global price changes, chain managment, barcode printing and more.